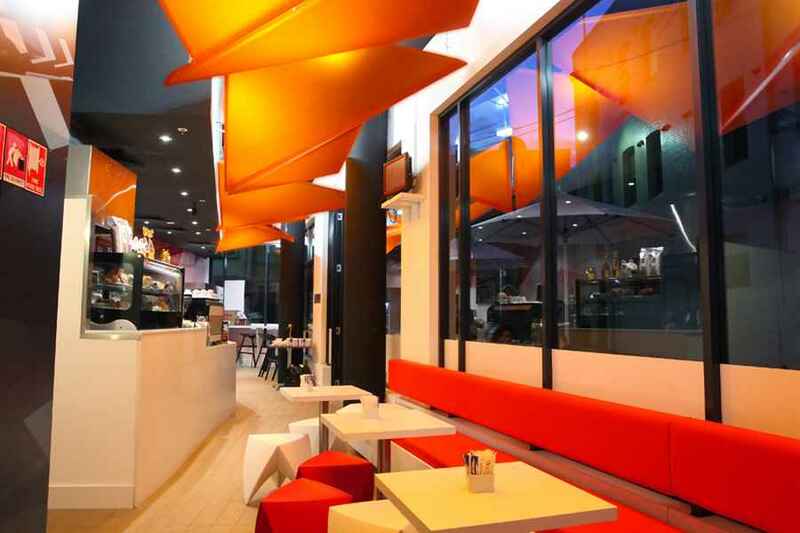 Tony Owen Partners has just completed the Fractal Café in Sydney. The café is located in the ground floor of the recently completed Boston University Student Housing building. The rear of BU is located on a narrow laneway in the city. It was a feature of the original design, that building was the cut back at ground level to widen the laneway and create a public square. The new Café addresses this square. The unique design of the ceilings is derived from the fractal canyons which are the main design element in the building. These canyons maximize solar access and natural ventilation, whilst the prismatic windows maintain privacy for the students. The geometry of the ceilings came from a photograph of the completed canyon windows. The ever changing geometry of these windows was interpreted here using orange plexi-glass. This photo was also used as a super-graphic on the café wall. The overall effect is a dynamic geometry which sits alongside the building itself. Design by Tony Owen, Rashna Sholapurwala, Esan Rahmini and Kathryn Hynand. The new student quarters for Boston University by Tony Owen Partners and Silvester Fuller Architects at 15-25 Regent Street, Chippendale is a unique design using fissures to provide maximum solar access to bedrooms as well as natural ventilation throughout the building. The eight-level, environmentally-efficient building can accommodate up to 164 students in a style to which scholars are not usually accustomed. It also has three lecture halls, a library, an Internet lounge, a rooftop terrace with a timber deck and an adjoining fully-equipped communal kitchen, plus cafe. Three years ago Boston University saw the need to improve accomodation and facilities for its visiting students, who pay around $17,000 for the semester. The design concept was by Silvester Fuller and was development through to completion by Tony Owen Partners. Construction was by Ceerose Pty Ltd.
Arup Partners provided the environmental analysis. The design uses large canyon-like slots in the façade which allow sunlight and ventillation to penetrate deep into the building and into each room. The windows in these slots have a rhomboid shape to maximise efficiency, and deliver a bold architectural façade which is illuminated at night through an ever-changing light show. The end walls of the slots are made from glass louvres that are seven storeys high, and the building also contains a seven-storey glass louvred atrium. “Air is drawn through the voids and passes through the building like gills, allowing the building to breathe naturally,” said Owen. “East-facing operable louvres on each level further help to lower ambient temperatures by drawing in fresh breezes. Tony Owen is at the forefront of three-dimensional digital architecture, and best known for Moebius House in Dover Heights as well as the futuristic eliza apartment building in Elizabeth Street under construction, also by Ceerose. Owen has a further 40 or so local projects in the pipeline, all of which explore complex shapes, fluid geometries and environmental initiatives.